I believe you produce what you are. That may sound a bit strange, but think about it for a moment. Does a fig tree bring forth grapes? Does a tomato plant produce green beans? Of course not. Can a non-believer produce spiritual fruit? Nay again. As it says in Genesis in relation to the species, “Everything after it’s kind (“genos” from which we get “genes). The child of God has the choice to walk by the flesh or by the spirit. Walking by the spirit is also called “abiding in Jesus.” Through the holy spirit, Jesus abides in us and we are able to make the conscious decision to abide in him. It’s interesting that the Greek word “meno” which means to “abide, dwell, remain” in the sphere of something is used 15 times in this short passage in first John. God is really emphasize this point to ‘abide in’ Jesus. See if you can count all 15 usages of the word ‘meno’ in the scripture from John 15 below. 1 I am the true vine, and my Father is the vine dresser. 2 Every branch in me that bears not fruit he takes away: and every branch that bears fruit, he prunes it, that it may bring forth more fruit. 3 Now you are clean through the word which I have spoken unto you. 4 Abide in me, and I in you. 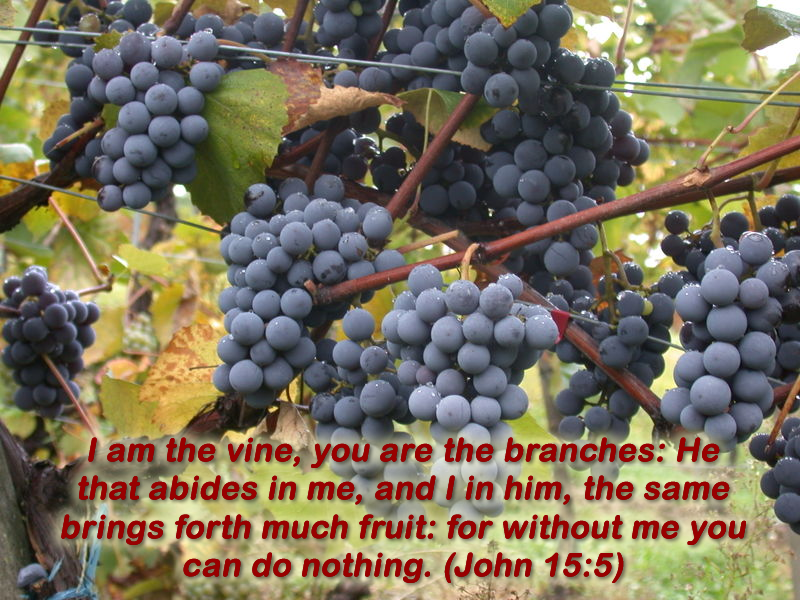 As the branch cannot bear fruit of itself, except it abide in the vine; no more can you, except you abide in me. 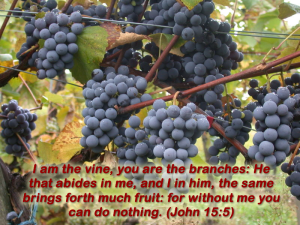 5 I am the vine, you are the branches: He that abides in me, and I in him, the same brings forth much fruit: for without me you can do nothing. 7 If you abide in me, and my words abide in you, you shall ask what you will, and it shall be done unto you. 8 In this is my Father glorified, that you bear much fruit; so shall you be my disciples. 9 As the Father has loved me, so have I loved you: continue you in my love. 10 If you keep my commandments, you shall abide in my love; even as I have kept my Father’s commandments, and abide in his love. 14 You are my friends, if you do whatsoever I command you. 15 From now on I call you not servants; for the servant knows not what his lord does: but I have called you friends; for all things that I have heard of my Father I have made known unto you. 16 You have not chosen me, but I have chosen you, and ordained you, that you should go and bring forth fruit, and that your fruit should remain: that whatsoever you shall ask of the Father in my name, he may give it to you. Bringing forth fruit that ‘remains’ is what the Christian walk is all about. That’s Jesus’ desire for each one of us, and we are not in competition with each other — we will each bring forth according to our own ability through the power of holy spirit within us. You produce what you are, but you are a composite human. You have the body of sin and the holy spirit. It’s your choice which you ‘walk by’ or ‘abide in.’ Jesus desires that you ‘bring forth much fruit’ and that ‘your fruit remains.’ The choice is yours! What will you produce? After the flesh or after the spirit?